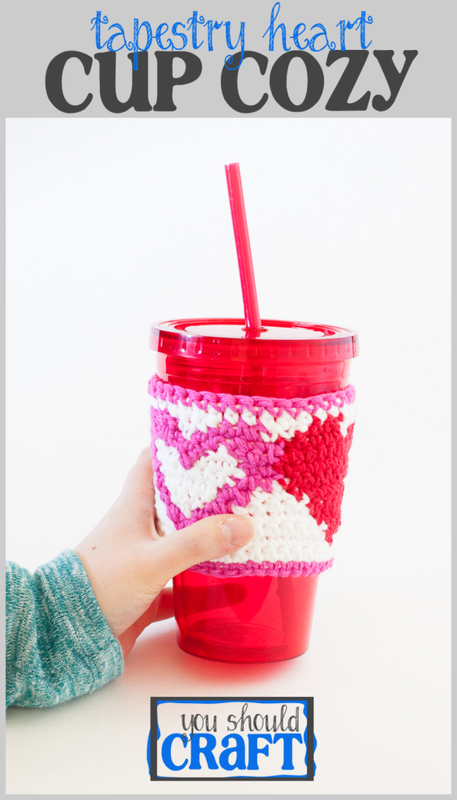 Protect your fingers and use our free pattern to crochet a reusable cotton cup cozy with an adorable heart pattern — perfect for Valentine’s Day or any day! Just say no to those cardboard sleeves at the coffee shop! With the Super Bowl over and done, and my present home team the Carolina Panthers defeated by my future home team of the Denver Broncos (which I guess makes sense, right? ), next up is Valentine’s Day! V-Day is not my jam, but I kept seeing beautiful red and pink heart crafts on Craftgawker and Pinterest, and I started to feel kind of left out! I spotted the Heidi Cowl from Divine Debris, and a little light bulb went off. I used her idea of rotating solid and outlined hearts to create the pattern for my tapestry crochet cup cozy! The tapestry heart cup cozy pattern uses 3-4 different colors at once (I chose red, hot pink, and white) and requires a lot of color changes and counting. However, it’s a small item and the whole cup cozy is worked in single crochet, so a beginning crocheter could use 2 colors and tackle their very first tapestry project! But first, double check your crafty stash or hit up the craft store for some supplies. This is such a cute little gift to give to anyone for valentine’s day! I used to love crocheting when I was younger. I need to get back into it! Thanks Gabby! You should definitely try crocheting again — IMHO, it’s awesome. What a cute idea! I would love to feature it in my last minute Valentine’s Day gift guide. That would be awesome, Rania! Let me know when it’s up or tag me on Twitter (@youshouldcraft) and I’ll be sure to share! This is so cute! I’ve never tried crocheting, but I think I would really enjoy it. Thanks for linking up at Welcome Home Wednesdays! So cute…drink cozies are so useful in hot climates. Thanks for adding your creative post to the Thursday Favorite Things Blog Hop…these have all been pinned to our group Pinterest board. See you again soon. Thanks Shellie!! I appreciate the pins and will be stopping by the blog hop again soon!